I've been following along since the beginning of the year when Jessica of Twin Fibers picked back up on one of her UFOs. Seeing the project as it progressed, you wouldn't think I would be so blown away by the finished project - but I was! I just love the look of a traditional quilt made with such striking, modern fabric. 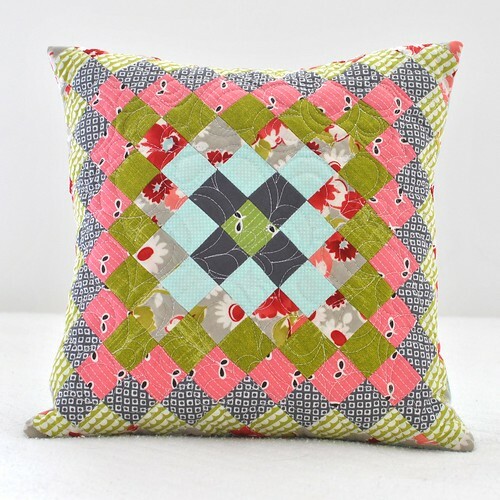 I couldn't commit to an entire quilt in this style, so instead I dug into my scraps and created a pillow! 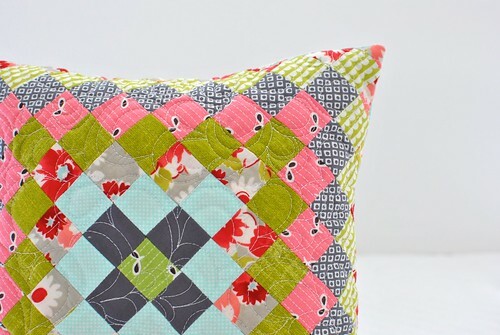 I love the Ruby fabric line by Bonnie and Camilla, so that was my starting point for this pillow. I added in some of the legacy Flea Market Fancy by Denyse Schmidt, Painter's Canvas in grass by Laura Gunn, a solid grey, some Mini Mikes in grey, and a few more prints from Ruby. Eventually I had enough scraps pulled out for an 11" square pillow. I finished the pillow front with some all-over paisley quilting. This is quickly becoming a favorite of mine! 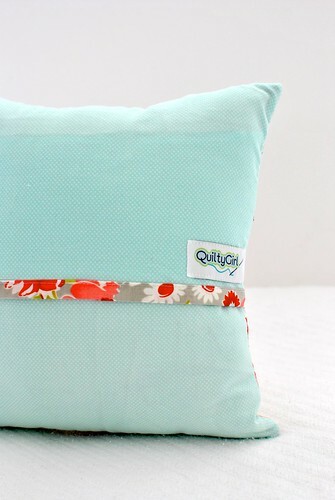 The back is an aqua polka dot from Ruby and an accent strip of the floral that inspired this color palette! This pillow is now listed for sale on Etsy!